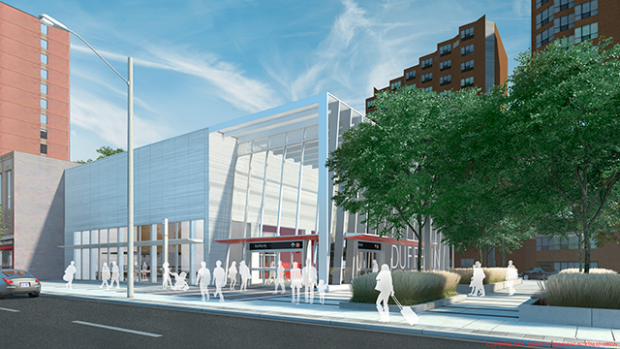 Fairbank Station will be an underground station located at the intersection of Dufferin Street and Eglinton Avenue West. the secondary entrance at the northwest corner of Dufferin and Eglinton. On-street connections will be provided to TTC buses. The station will include a plaza at the main entrance. The plaza will incorporate the existing St. Hilda’s Parkette, located at the southeast corner of Eglinton and Dufferin Street. Retail spaces will be located at street level within the main entrance. The station plaza that will be integrated with St. Hilda’s Parkette will incorporate a fountain or a water feature, and will provide equivalent gathering area and seating functions as are currently provided in the existing parkette. Download the station fact sheet.